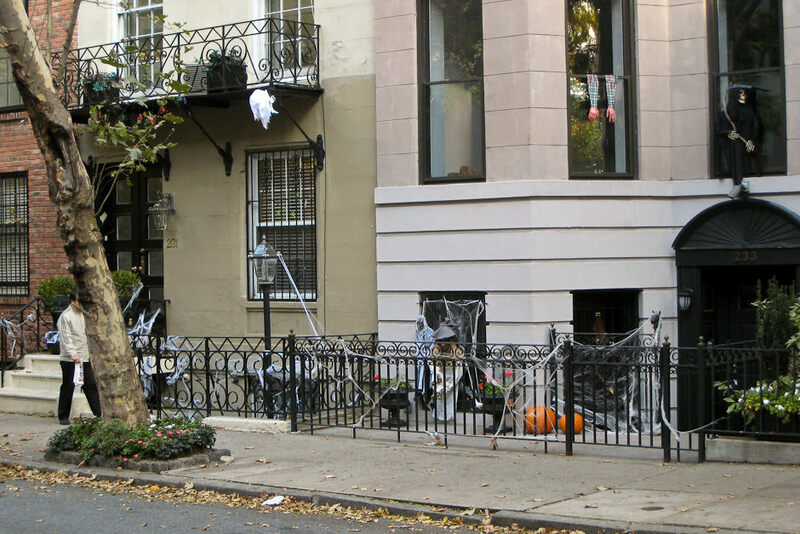 Growing up in Manhattan means that you sometimes have to do things a little differently than, well, pretty much the rest of the country, and as Halloween approaches, and I compare stories of youth with colleagues and friends, I’m beginning to understand just how different Manhattan Halloweens are compared to others. I’ve heard about it from friends and seen references to it in movies, but since I’ve never seen it in person, it’s sort of like Bigfoot…I’m beginning to doubt it really exists. In Manhattan, there isn’t that one special house in the area that goes overboard with Halloween decorations; that one special house that everyone from several streets over comes to visit because everyone knows they have the best candy and obscene amounts of it; that one special house that truly embraces the spirit of Halloween and shames all the others around it for even trying to be festive. Unless you live in an area that has single-family townhouses (which is somewhat rare on this island) you really won’t see Halloween decorations, or any other holiday decorations, adorning the outside of a building. Multiple dwelling abodes must conform to the lowest common denominator wishes of its inhabitants, and it’s always safest to not display any decorations than risk offending someone who, for whatever reason, is offended by Halloween. The youngest Halloweens I can remember, before I was eight or nine years old, were spent taking the elevator with my mother to an upper floor in my apartment building and working our way down floor by floor, all the while using my mother’s judgment as to which apartments to ring. I’m not sure if she worked it out ahead of time with the “Halloween friendly” people in the building, but I don’t remember seeing many decorations or other telltale signs that would indicate that the occupants of the apartment had the candy which I sought. As I got a little older, the annual Halloween search-for-free-candy branched out, both physically and organizationally. Starting at about the age of eight or nine I was allowed to go trick-or-treating at a friend’s apartment building. This was particularly advantageous to me since his building was larger than mine and had a lot more Halloween friendly inhabitants, and therefore the potential Halloween lucre was exponentially greater. It was also run much more efficiently. About a week prior to Halloween, a sign-up sheet would be posted by the elevators or mailboxes, and anyone who was “Halloween friendly” could add their name, apartment number, and times they would be available to the list. On the night of Halloween, someone would make copies, and all the ghouls and goblins could just grab a copy and be assured that they would hit the maximum number of “Halloween friendly” apartments that they could. About the only way it could have been more efficient was if all the “Halloween friendly” apartments pooled their candy together in a big pot and prepared giant bags of candy for everyone in advance, which they could just hand out at the entrance to the building, saving us the hassle of going door-to-door. There was one roadblock standing between me and what could have been the largest candy treasure of all time…by rule, at least one member in the group had to actually live, at least part-time, in said building. I couldn’t just enter any building, grab a sign-up sheet, and abscond with copious amounts of candy…nay, I must have an accomplice, a partner-in-crime if you will, that was known to the building staff. So, on Halloween evening, after making the rounds at my building, I’d head over to my friend’s building, and start all over. After collecting our loot for the evening, we would head back to his apartment in the building and proceed to compare, and then trade, our candies for those favorites that we didn’t get enough of. I would then head home, satisfied in knowing that I had enough candy to last me about four days. This procedure lasted about two years before the next great idea changed the way the game was played. If we got a big enough group of friends in the same relative neighborhood, started out early enough, split up into smaller groups, say two-at-a-time, we could hit several apartment buildings in the neighborhood, meet afterward, and divide up our loot evenly. This worked quite well the first year, but the second time we attempted it, that seemingly stale plot device used in every Hollywood heist movie actually reared its ugly head: jealousy. The person who lived in the largest apartment building wanted more candy since he assumed he brought in the most; the person who lived in the second largest building, wanted the second largest slice of the pie, and so on, and so on. That evening, each of us left feeling like we had been screwed over by someone else in the group. We haven’t spent Halloween together since.